Need more information about booking Property 2562423 ? Amandari is a 4 bedroom villa set in a peaceful and idyllic location with breath taking views over the Mahaweli river valley. 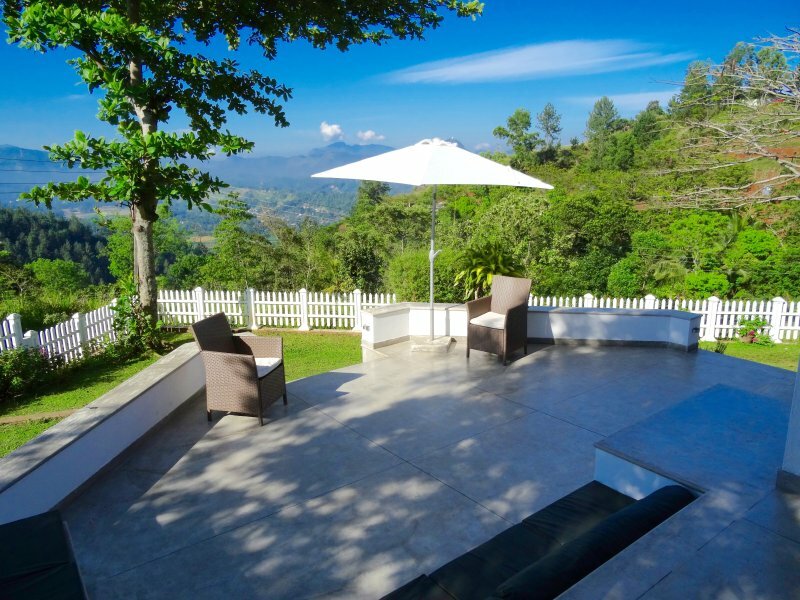 Only 5 km away from the fabulous Peradeniya Gardens, it can accommodate up to 9 guests in 4 spacious, well-appointed bedrooms and offers living and dining spaces, a modern kitchen and generous panoramic terraces. The total floor area of the villa is 3,500 sq. ft.
An ideal getaway for families and friends, the villa is surrounded by nearly one acre of lush garden.There is an ample space for children to play, providing an oasis of tranquillity and relaxation for its guests. 3. Garden suite consisting of triple room with en suite bathroom and private garden terrace. Bed linen and towels are provided for all rooms. The breakfast, lunch or dinner are available. BBQ facilities are also available. Breakfast can be served either as traditional Sri-Lanka style or as English breakfast. Details and prices can be forwarded on request. Please note that in the villa there is no accommodation available for the drivers. Smoking is not permitted in the house but is fine on the verandahs and terraces. Host Dammi and Anura will be there to assist you whatever need you may have during your stay at the villa. Smoking is strictly prohibited inside the house but there are no restrictions concerning the outdoor spaces. We stayed at amandari Villa for two days and we are glad we made the right choice. It is a perfect location for a relaxing holiday, away from the city. The view was breathtaking. The villa is well maintained and clean. We received excellent service during our stay. Certainly looking forward to being at amandari next year. It was a really nice experience, the villa was really nice surrounded by nice view, well maintained, service also i should tell was really good. Everything was good !! Ideal place to get away from the concrete jungle. I was looking for a peaceful and calm retreat where to relax and immerse myself into nature and landscape. I found the perfect spot at amandari. Neat and clean, very comfortable and friendly place with incredible views where you feel on the top of the world, yet it's only few miles away from Kandy town and many local attractions. I'm going back again at the end of august for a second visit, a place that I definitely recommend. My family are from London and we have always wanted to visit Sri Lanka. The moment we arrived at the amandari Holiday Villa we knew we had made the perfect choice for our family. The villa was furnished and equiped to an immaculate standard and the views were stupendous! The staff were very helpful and informative about local sightseeing. The views were incredible, I had no idea that Sri Lanka was so beautiful. My children were also very happy and enjoyed the gardens and luscious surroundings as well all the fantastic activities we enjoyed in and around Kandy. We thoroughly recommend the villa and look forward to booking again next year-we will definetly going back. We are from Spain and didn't know what to expect, although we had high hopes in regards to our holiday in Sri Lanka. Thank you for an exceptional experience! The villa is finished to such a high standard; it was beyond anything we imagined. The staff were very helpful and polite-the food was fantastic. The views were breathtaking and our children had an incredible time in a safe environment. We enjoyed visiting Kandy and were pleasantly surprised by how close the villa was to all the local attractions. We thoroughly recommend this villa to everyone and look forward to staying again as we have already booked for next year! During the month of january we were finding a tranquil place to spend our holidays..luckily we got to know about amandari holiday villa and our decision was correct..really it was an amazing place with a calm and a quiet surrounding..the house was nicely furnished and the garden was so beautiful..house was surrounded by mountains and we enjoyed the service provided by the kind staff..we tasted delicious food and we felt like it was our own place..marvelous surrounding,fresh air and the nature made our holidays superb.we hope to visit again and again amandari.. I live in California and during my 3 week winter vacation, I decided to trek around asia. I stumbled upon this magnificent country through the advice of a friend. He recommended this villa to me and it did not fail to satisfy. Let me start off with the location, absolutely breathtaking. I am a huge fan of the outdoors, and the scenery from the top of the balcony is something that will forever be etched in my mind. If you are a fan of the outdoors you will immediately fall in love with this place. Located on top of a mountain range, this villa has everything to offer to anyone looking to find peace and tranquility. It is the perfect holiday retreat. You will not be intruded by anyone except nature. Our caretakers Tissa and his wife were very friendly and cooked exquisite Sri Lankan meals, and were always there to help if we needed anything. The villa has a lot of history behind it. It was very clean, and it could easily accommodate around 6-8 people. I found it very spacious and comfortable, definitely more than what I bargained for. The garden is very lush, and the view is absolutely breathtaking. There is an infinite amount of trails to hike, and you will encounter countless amounts of animals. I am very thankful to the owner of the villa, Kumari Mazza, for being very honest with me, as I found the villa to be exactly what she described it to be. I am a seasoned traveler, and I would recommend this place to anyone looking to get away and spend their vacations in peace and harmony. This villa lives up to the term "holiday retreat." I have been travelling extensively throughout Sri Lanka, and always wanted to come across a place like that...During my last trip in august I was about to quit the area, quite tired of same hospitality offered and while speaking to some locals I have bern addressed to that wonderful place with spectacular views and relaxing atmosphere, the ideal getaway from modern city life. Nice, comfortable and well kept villa with nice rooms, incredible terraces, lush garden. Lovely walks around the property, friendly environment and beautiful attractions few kilometres away, the Peradeniya botanical gardens above all and of course the city of Kandy.I'd rather buy this place, but since it is not in my close future plans, I definitely recommend this place...I'll be back next year with more friends." You can get in touch with Kumari (the owner) through the contact form on this page. Send Kumari (the owner) an email through the contact form on this page. Alternatively, if there’s a phone number on this page, you can call them. How do I contact Kumari (the owner)? If you’ve already booked, go to Manage your booking to view Kumari the owner's contact details or send them a message. Or send Kumari (the owner) an inquiry through the Contact the owner/manager form if you’d like a quote or more info first. When you pay online through the Ready to book? form, a booking request is sent to Kumari (the owner). You’ll find out within 24 hours whether they’ve accepted - no money will leave your account before then. You can also request a quote from Kumari (the owner) through the contact form. The owner will email you the total cost for your dates and a link to book and pay online. Use the Ready to book? form to pay provisionally online. You can pay by credit/debit card or PayPal. Kumari (the owner) will have 24 hours to accept the booking and no money will leave your account before then. Why can't I call Kumari (the owner) before booking? You’ll need to contact Kumari (the owner) to do this. Send them a message in Manage your booking or through the contact form on this page. You can request to change the dates or number of people on your booking via the Manage your booking page. To change your dates use the Edit booking button. If you need to change the number of guests staying then send Kumari (the owner) a message. If Kumari (the owner) agrees, they’ll send you a revised quote outlining the changes. You can review and accept/decline this from the Manage your booking page. You’ll have 48 hours to take action before the revised quote expires.